With Kobe Bryant’s return to the NBA this season after tearing his Achilles tendon last spring, there has been increased attention on this injury in basketball players. Basketball athletes are at an increased risk for Achilles tendon tears due to the demands of the sport, including repeated acceleration, change of direction and jumping.Older athletes also face a higher risk of Achilles tendon tears,making this a particularly relevant injury for the mature competitive and recreational basketball player. 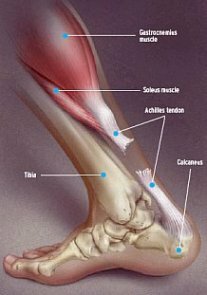 The treatment of Achilles tendon tears is under increasing scrutiny. Surgical intervention is associated with a reduction in re-rupture compared to non-operative treatment, but adds the risk of infection and other complications. Risk factors for infection include age over 60, diabetes, smoking, delay in treatment more than 7 days, and pain in the tendon before injury.There is a growing body of evidence that functional rehabilitation can have very good outcomes for patients with Achilles tendon tears but there is still debate over the relative rate of re-rupture and the comparative recovery of strength and power.Athletes tend to prefer operative treatment for the potential benefit in terms of decreased re-rupture rate and more complete recovery of strength and power. minutes per game and performance (based on the NBA Player Efficiency Rating) compared to their pre-injury performance and compared to healthy controls. Interestingly, those who underwent surgery were significantly less likely to get back to the NBA than those who did not. The good news for Kobe is that a higher Player Efficiency Rating pre-injury was associated with a greater likelihood of returning to professional basketball..